Trumpets! Sax! Drums! The Blue Devil marching band is back for another season and they are not here to play any games. The award winning marching band has lots to offer during the 2017 season. With the band being the official band for the University of Richmond they are planning to show up and show out every time they hit the scene. Peppin’ it up Blue Devil Marching band gets ready to perform in a school-wide spirit walk to kick off back to school. 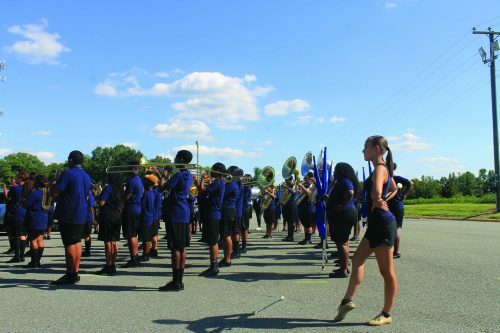 The band paraded across campus as the student body began to follow to show their Blue Devil pride. Blue Devil band member Jaelyn Robinson says she’s excited because the band will be playing a different genre of music this season. She also says “I’m hoping that this year we will win more competitions and do more performances.” When asked about how the new drum major adds to the dynamic of the team Jaelyn added “she’s a lot harder on us than any other drum major we’ve ever had, but that’s a good thing and it makes us respect her more.” The Blue Devil marching band has lots of goals set for themselves. Being a band for Varina Athletics and at the colligate level for the University of Richmond, the band has a lot on their plate. Now it’s time to sit back and watch them put on a show the best way they know how.